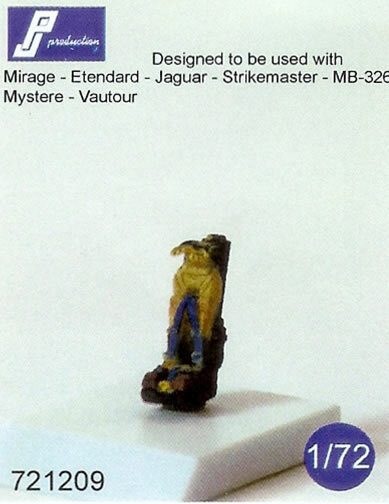 For Mirage, Etendard, Jaguar, Strikemaster, MB326, Mystere & Vatour. Above aircraft suitability quoted from PJ Productions’ notes with seats. 721126: 4 x Resin figures (1 with separate arms, legs and torso). 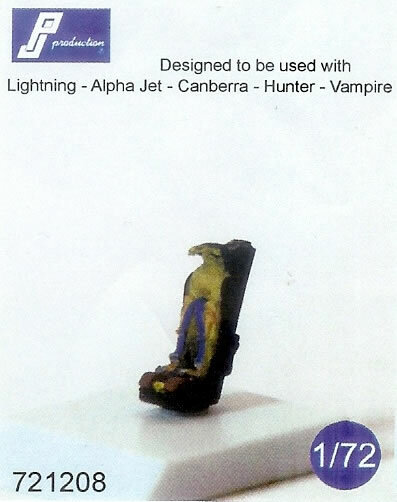 721208: 2 x Resin ejection seats (2 parts each). 721209: 2 x Resin ejection seats (2 parts each). 721210: 2 x Resin ejection seats. Good quality production, nicely sculpted figures and seats. 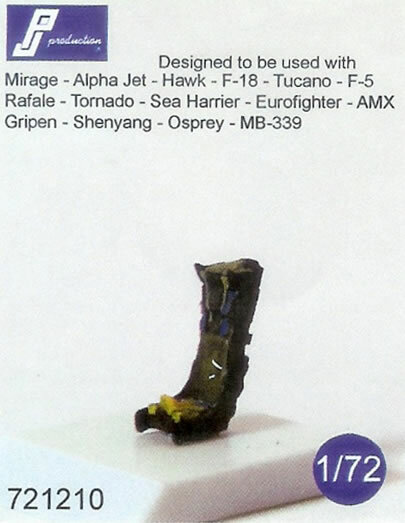 Provides for at two different versions of the MB Mk 4 ejection seat. Nationality and time period of the SAR crew is not advised. No painting guide other than a small colour image of the finished accessory in all cases. Nice accessories that can be accurately painted once a little reference hunting is done. Offering different versions of the widely used Martin Baker Mk 4 seat is a plus in this scale. The absence of painting guides seems a bit penny-pinching given that they are provided other brands at a similar price-point. It would also be nice to be able to identify the air arm and period the figures represent. 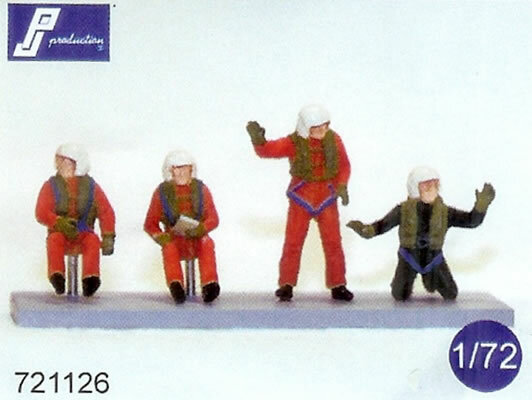 The figures and ejection seats reviewed here each come in a plastic zip-lock bag stapled to a card header. The only painting guide is a small image of the finished items included with each set. I have used PJ Productions own images from their header cards as they illustrate the painted items. In the case of the ejection seats two per packet are included. The resin items are produced to high standards although there is quite a bit more feathery flash on the figures, but this should be easily removed. This set consists of four nicely sculpted figures, although their nationality and time period is not stated on the packaging. All I can conclude is that they look to be NATO-like from possibly the 1970’s to present. Three of the figures are cast as one piece each, whilst the fourth crouching figure consists of legs, torso and arms. The very basic painting guide (a small picture) may help to keep price down but some may expect something better. Two nicely cast seats per pack representing slightly different versions of the MB Mk 4. Each has separate firing handles to mount above the headrests. They seem fractionally narrower than some other brand examples of the same seat in the same scale, but look fine to me. In fact given the vagaries of some kit cockpit tubs and over-scale side-walls a slightly slim seat could be advantageous. I think many would expect a painting guide with colour call-outs, but on the other hand images are not hard to come by. Again two seats per pack and nicely cast. The lack of a painting guide also applies. These are all well produced resin detail sets. The SAR crew would add interest to any SAR helicopter model, but it would be nice to know which air arm and time period they are suited to. The ejection seats are crisply cast and look good. It’s nice to see some trouble being taken to cater for different versions of the same mark of seat in this scale. Whilst not the end of the world, the absence of painting guides other than small colour images of the finished accessories is maybe a bit penny-pinching. However suitable references are not too hard to find. So despite this I’m still happy to recommend them. Thanks to PJ Productions for the review samples.